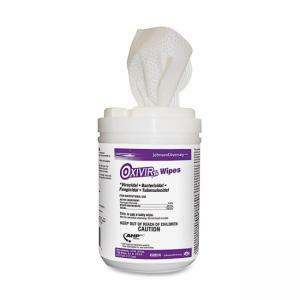 Ready-to-use wipes feature a disinfectant cleaner based on proprietary hydrogen peroxide (AHP) technology to deliver fast, effective cleaning performance. Cleaner disinfects in 60 seconds. Virucide, bactericide, tuberculocide, fungicide and nonfood contact sanitizer kills MRSA and Norovirus. Each wipe measures 6" x 7". Full Size: 6" x 7"